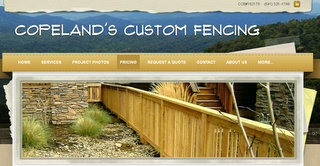 Copeland Fencing & Construction has been building fences and decks throughout the entire State of Oregon, from our home base in Bend, since 2008. Jeremy Copeland started Copeland's Custom Fencing after recognizing the need for a quality custom fencing option in Central Oregon, without high overhead. Then in 2014 Changed the name to show the wider variety of construction projects that they are capable of completing. We promise Quality Without The High Price for any of your custom fencing or decking needs. When looking for a fencing contractor, or deck builder in Bend and Central Oregon, or anywhere else in the state, look no further than Copeland Fencing & Construction, llc - A Fencing and Decking Contractor You Can Trust.